Man dies in mysterious circumstances: One Mehma Singh of Kikkarkhera village died under mysterious circumstances near cattle shed at Alamgarh village, 4 km from here on Saturday night. He was son of Karam Singh, maternal uncle of the Dera Sacha Sauda chief Baba Gurmeet Ram Raheem Singh, local devotees confirmed on Sunday. Alamgarh residents said Karam Singh collapsed while walking on the link road. The police rushed to the village but preferred not to initiate proceedings as the aggrieved family was not interested in getting the post-mortem examination conducted, sources said. Attack on Raj Baksh condemned: Expressing concern over incidents of violence after the panchayat elections, Sunil Kumar Jakhar condemned the attack made on Raj Baksh, block president of the Congress committee in Jalalabad sub-division, last week. The fact was that the culprits dared to attack a close relation of a former minister, Hans Raj Josan, inside court complex in broad daylight spoke volumes of the lowest level of law and order situation, he said. There were scores of attacks on the pro-Congress workers who dared to fight against the ruling alliance in the PRI elections. A senior functionary of the BJP was allegedly mounting all kind of pressures to prevent election of a Congress worker as sarpanch in village Katehra near here, Jakhar said and apprehended such adamant and authoritarian attitude could further make the atmosphere tense in the area. One dead: An elderly person died in the waiting room of the Bathinda railway station. The person was lying there in a critical condition. He was taken to the civil hospital by the volunteers of the Sahara Jan Seva where he was proclaimed dead. The deceased could not be identified. The NGO chairman Vijay Goel informed that the GRP got the postmortem conducted and handed over the body to the NGO for performing the last rites. Three injured: Three people were injured in a collision between a scooter and a motorcycle that took place at the Multania bridge. The injured were rushed to the civil hospital by volunteers of the Sahara Jan Seva. In another incident, two youths were seriously injured when a tractor-trailer hit a scooter near Beed Talab. They were also rushed to the civil hospital for treatment. Board chief assumes charge: President of the SAD Sukhbir Singh Badal on Sunday presided over a function where newly appointed chairman of the Small-Scale Industry Development Board Inderjit Singh Pradhan assumed charge. Vice-chairman of the Medium-Scale Industry Development Board Satish Dhanda was formally installed at the function. Badal said the new boards would work towards reviving the industrial economy of the state. Three booked: The police has booked Sukhwinder Singh, his brother Mohan Singh and mother Kulwant Kaur of Chandigarh for allegedly torturing Harcharan Kaur for dowry. In her complaint, Harcharan said she was married to Sukhwinder and the accused used to maltreat her for getting dowry. 4 held with drugs: The police arrested Balbir Singh of Khurala village and seized 70 gm of smack from him on Saturday. A case has been registered. Similarly, 7 kg of poppy husk was seized from Vijay Kumar, Manjit Singh and Saurav Kumar here. All the three have been booked under sections 15, 61 and 85 of the NDPS Act. Pirated CDs: The police arrested Pawan Kumar of Hakumatpur and Paramjit Singh of Kampur and seized 400 CDs from them. Vacant posts: Members of the Science Teachers Association expressed resentment against the district education office “for its failure” to provide posts of maths teachers in middle schools. Association’s state press secretary Jagtinder Singh Sohal said vacant posts were greatly affecting results. Kerosene depot sealed: A kerosene depot at Sukhsal village here was sealed following complaints against its operator. Villagers alleged that depot operator Ashwini Sharma had been selling kerosene on black market. Earlier, residents of the area had burnt an effigy of food and supplies minister Adesh Pratap Kairon. Installation ceremony: The installation ceremony of the Rotary Club and the Inner Wheel Club was held here on Saturday. Surindra Seth, former district governor of the club, was the chief guest, while Vanneta Seth, PDG, presided. The following have been elected office-bearers of the Rotary Club: president-Varinder Dogra; general secretary-Ramesh Mahajan; and treasurer- LD.Dewan; and of the Inner Wheel Club: president- Kiran Kapoor; general secretary -Payal Dawar; and treasurer- Lovely Juneja. In-laws booked: The Kahnuwan police booked Inderjit Singh and his father Teja Singh and mother Gurbachan Kaur here on Sunday on a complaint of Lashkar Singh of Kotli Harchanda to the Kahnuwan police station. He stated that his daughter Mandip Kaur was married to Inderjit of Saidowal Khurd five years ago and was being harassed by in-laws for more dowry. 74 marriages solemnised: As many as 74 marriages were solemnised at the Kali Devi temple by the Aradhna Kala Manch here on Sunday. Chief editor of the Hind Samachar group of newspapers Vijay Chopra blessed the newly wed couples and congratulated their parents. He praised the efforts of the manch and urged other social organisations to come forward for such noble causes. Municipal corporation commissioner M.P. Arora and SP (city) S.K. Sharma were also present. PRESENTATION: Sqn Ldr (Retd) Bakshish Singh gave a presentation on the topic ‘Thrills of flying an aircraft’ to the members of Aerospace Club at Mount Carmel School, Sector 47, here on Saturday. It included the basic laws of flying aeroplane. Around 45 student members of the club attended the presentation. The session came to an end with a question - answer round. WORKSHOP: Top Careers & You (TCY), in association with IDP-Australia, will conduct an IELTS workshop at its office in Sector 8 on July 21. During the workshop, students will be imparted strategies and tips that would enable them to score higher bands in the International English Language Testing System exam. Saroj is Rotary Club chief: Haryana Governor Dr A.R. Kidwai installed Rotarian Saroj Jhawar as president of the Rotary Club, Chandigarh Midtown, and her team at a function here on Sunday in Sector 2, here. Justice Nirmal Yadav of the Punjab and Haryana High Court and Past Rotary International president Rajendra K. Saboo were also present. Saroj Jhawar is the lone lady president in Rotary District 3080 that spans vast areas of Punjab, Haryana, Himachal Pradesh, Uttarakhand and whole of UT Chandigarh, having 72 clubs in the district. Petrol station looted:Six robbers looted a petrol station in Dhurkhera village on the Ambala-Hisar road on Saturday night. A case has been registered at the Ambala City sadar police station. According to the police, six unidentified persons riding motorcycles came to the petrol station at around 1 am. They all were armed and had their faces covered. One of the salesmen at the petrol station Tarshem Lal said the robbers were on three motorcycles and asked for petrol. As one of our salesmen started refueling their bikes, two of the robbers demanded cash at gunpoint and decamped with Rs 30,000, he added. Meeting: A general house meeting of the Haryana Non-government College Principals Association was held at GMN College, Ambala Cantonment, on Sunday. Outgoing president Dr Desh Bandhu spoke about the achievements of the association and discussed matters relating to higher education at Kurukshetra University, MDU, Rohtak, and Haryana government at length. He also presented budget of the association. Outgoing general secretary Dr S.S. Goyal thanked the delegates and Dr R.R. Malik, GMN College, Ambala Cantonment, was elected as the president of the association. Convict escapes: A convict, Surjit, escaped from the police custody here on Sunday. He was undergoing medical treatment at the local Civil Hospital. According to the police, Surjit, a resident of Gurgaon district, was undergoing life imprisonment in the Mahendragarh district jail. He was taken to the hospital following a stomachache. He was admitted to the prisoner ward where two constables were put on duty as his guards. When both the constables went to answer the call of nature, Surjit somehow managed to open his handcuffs and ran away. A case has been registered against him. Traffic blocked: Residents of three colonies of the town blocked traffic at three places, Leo Chowk, Bawal Chowk and Jhajjar Chowk, in succession here on Sunday in protest against the erratic power supply as well as the apathy of DHBVN officials towards genuine complaints of the aggrieved public. The blockade at Bawal Chowk was lifted after the hanging electric wires, which had killed a cow, were replaced. The demonstrators ended the blockade at Leo Chowk and Jhajjar Chowk only after senior officials assured them of expeditious action in the situation. 2 killed in accident: Two persons, Jitender of Bhawar village and Anurag of Bhambewa in Jind district, were killed when the maxi-cab they were travelling in collided head-on with a canter near Nuran Khera village on the Gohana-Jind road on Saturday. Two others, Shiv Kumar and Anand of Bhawar, were injured in the accident and were admitted to the Gohana Civil Hospital. The maxi-cab was on its way to Bhawar from Gohana. Probe ordered: A departmental inquiry has been ordered against two police personnel of the city police station for not registering an FIR of a stolen mobile. The two allegedly did not take note of the two complaints lodged by a resident of Jagadari, Milap Singh, who stated that his mobile, which was kept in his scooter, was stolen by some persons. Milap Singh had made a complaint on June 3 and later on June 25, but no one took note of it. Jagadhari DSP will conduct the inquiry against the two cops, who allegedly failed to perform their duty and harassed the complainant. Snakebite kills 1: Pawan Kumar (35) of Rachheda village near here was bitten by a snake when he was sleeping in his house. He was rushed to the district hospital here, where he was referred to the IGMC hospital, Shimla. But he died on the way. Youth commits suicide: A youth committed suicide by hanging himself at Chowari on Saturday, according to a report received here on Sunday. The deceased was identified as Ravinder, who was under trial in a case of selling narcotic capsules. Due to the fear of being penalised, the deceased had earlier too tried to commit suicide. The body, after the post-mortem, was handed over to the kin of the deceased. College teachers’ demand: The All-India Federation for University and College Teachers has urged the Central Government to implement recommendations of the Sixth Pay Commission. In its meeting held here, the district unit of the organisation expressed concern over the inordinate delay in the implementation of these recommendations. The organisation urged the government to take immediate steps for according Cabinet approval to the recommendations in the interest of government officials. Gang of thieves busted: The Dalhousie police arrested a gang of three thieves, who stole telephone poles, on Saturday. The vehicle in which they were carrying the poles was also impounded. Officials of BSNL, Dalhousie, had lodged an FIR with the police. On the basis of it, the police busted the gang of three thieves - Sant, Sany and Vanod. The persons involved in stealing the scrap of telephone poles from the Bagdhar area were also arrested, the sources revealed. 8 hurt in bus mishap: Eight persons were injured when the private bus in which they were travelling overturned near Saloni on Sunday morning. There were 55 passengers in the bus (HP-67-0323) and it was on its way from Saloni to Nadaun. The accident took place at Soonwi. The injured, Jamna Devi, Rachna, Brahmi Devi, Sarvu Devi, Kaushalya, Lata Devi, Raksha and Ashok Kumar, have been admitted to the Hamirpur district hospital. The driver of the bus has been booked for negligent driving. Water supply: Resentment prevails among the inmates of Vishnew Giri Ashram, near Gupt Ganga, here, against the IPH as the ashram was without the drinking water facility for the past few days. Sat Pal, in charge of the ashram, said on Sunday that despite their repeated requests, the department had failed to restore the supply. He sought intervention of the Chief Minister for the restoration of the water supply, as the authorities were not attending to their complaints. 2 girls crushed to death: Two minor girls were crushed to death under a jeep near Rajpura, about 10 km from Nalagarh, on Saturday. The accident took place on the Rajpura-Mussewal road. Rajkumari (11) and her cousin Kiranbala (7) were filling water from a roadside tap when the incident took place. Jaswant, cousin of the deceased, was driving the jeep. He has been arrested by the police. Fire in shop: A fire broke out in a shop at Khera, near Nalagarh, on Saturday night. The loss was estimated to be around Rs 3.5 lakh. The fire was first noticed by the shop owner, Jagdish Chand, who lives nearby. Fire engines were pressed into service to douse the flames. Jagdish has alleged that his nephew was behind the incident. He said his nephew had worked with him for a few months. He had sacked him recently. A case has been registered. Row over woman’s death: Rita Devi, a 21-year-old resident of Dharampur who was taken to the local hospital in a critical condition by members of her family on Friday, was declared brought dead by the doctors. The parents of the woman suspect some foul play behind her death and have demanded a probe into the incident. Rita was married to Sukh Dev, a farmer of Dharampur, about a year ago. Even the post-mortem report remained inconclusive on the exact cause of death. The viscera has been sent to the Junga laboratory for forensic examination. LPG leakage: Subhash (28) and Ankit (22) of Nohra Dhar village, about 100 km from here, suffered burn injuries while cooking food on Saturday night. LPG leakage is said to be the cause behind the incident. A major tragedy was averted as they succeeded in turning the cylinder knob off in time. They were rushed to the Rajgarh subdivisional hospital where their condition was stated to be stable. No religion teaches hatred: Moulana Jahir Ahmed Khadim, national deputy secretary,the Publicity Department, Jamayat Ahemediyya International, while addressing mediapersons here on Saturday, said no religion in the world taught to hate other religions but some people in order to achieve their personal ends tried to divide nations, religions and mankind which was not taught in any religion. He said Muslim Jamayat Ahemediyya International’s motto is “Love for all hatred for none”. National integration camp: To strengthen the bond between different languages of the country, a seven-day national integration camp kicked off at border town of Uri in north Kashmir on Sunday. The camp is to foster the spirit of national integration, deputy commissioner, Baramulla, Baseer Ahmad Khan, who is also the chairman of the Nehru Yuva Kendra, said after inaugurating the camp. Organised by Nehru Yuva Kendra Baramulla of Union Ministry of Youth Services and Sports, the camp is attended by over 200 students of different districts of Jammu and Kashmir and seven states of the country including West Bengal, Punjab, Bangalore, Uttar Pradesh and others. The Deputy Commissioner said holding such camps is a dire need of the time as these help in integrating the opinion of different people irrespective of their caste, creed or colour. Amarnath yatra suspended: The authorities on Sunday suspended the ongoing Amarnath yatra after heavy rains along the two routes to the holy cave shrine in south Kashmir Himalayas. The yatra was suspended from both sides - traditional 46-km route from Pahalgam in Anantnag district and the shortest 12-km distance from Baltal in Ganderbal district - around 12.30 pm as heavy rains rendered the tracks slippery, official sources said. Helicopter service to the shrine has also been suspended in view of the inclement weather, sources said adding that none of the yatris are stranded along the tracks and they are safe as all of them have reached halting station. A record number of over 4.94 lakh pilgrims visited the 3,880-metre-high holy cave till last evening since the commencement of the yatra on June 17. This is the highest number of pilgrims who had visited the cave shrine housing the naturally formed ice Shivlingam in a single year, sources said. A view of a classroom of the school for rural students started by IET Bhaddal at Ropar. 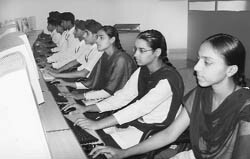 Institute of Engineering and Technology (IET), Bhaddal has started a school for rural students on the institute’s premises. The school is part of a project reserving 10 per cent seats for deserving students from rural areas in engineering and other regular courses. School’s idea came to IET Bhaddal CEO, Ravinder Singh after a meeting with Chief Minister Prakash Singh Badal in April 2007 asking leading colleges to do some thing for rural students. "We started a school - GCS collegiate school with classes starting from class IX on IET Bhaddal campus ," says Ravinder Singh. Bhaddal IET’s faculty imparts education to students utilising infrastructure developed to engineering standards. GCS collegiate school aims at acting as a nursery for engineering education and preparing students to think beyond the curriculum. "If the Punjab School Education Board grants affiliation to the school from first standard to class XII then we can have budding engineers who can be easily drafted into field of technical education. Bhaddal IET has made a provision to set school students in engineering courses and allow them fee concession too", says chairperson Kulwinder Gurcharan Singh. In addition to regular courses, students from rural areas are trained through short-term job- oriented courses like stitching, embroidery, welding practice, machine practice, I.T. awareness camps and subject-wise coaching etc. All these courses are being run through a rural development wing. The institute has also set up rural libraries, where books and newspapers are provided regularly . To encourage admissions of rural students to engineering courses, students hailing from villages in 5 km of the institute are also awarded fee concession of Rs 5,000 per semester. Student of SDKL DAV Centenary Senior Secondary Public School, Mansa, Nipun Bansal son of Dr Pawan Bansal got third position in Punjab PMET conducted by Baba Farid University of Health Sciences, Faridkot, securing 716 marks out of 800. Nipun Bansal has also qualified All- India CBSE PMT Test (550 Rank), and got 54th rank in medical entrance test held by CMC Ludhiana. Along with these he also qualified for the Armed Forces Medical College, Pune and he got 198 rank in Manipal CET test. In the preliminary PMT test of Indra Prastha University, Delhi he also got 458 marks out of 600. S.S. Thakur principal of the school and teacher Rajneesh Goyal said Nipun Bansal had been a brilliant student. This student got 94.8 per cent marks in class X and 86 per cent in 10+2. He aspires to research in cancer disease because people of the Malwa region have been facing danger of cancer. Nipun is from Mansa with his father an orthopaedic surgeon, mother an ayurvedic medical officer, and Shikha Bansal a student of final year MBBS student of government medical college , Amritsar. Kamaljeet Malwa, president of the Sabhyachar Chetna Manch, Mansa, has been creating awareness against female foeticide in his own way.The manch under his leadership has been organising functions to celebrate Lohri of girl children by functions for three years. The manch has been sensitising people against the killing of unborn daughters. Kamaljeet was honoured with an appreciation letter on the eve of Republic Day in 2006 by the district administration, “best worker award” by the Punjab State Electricity Board in January 2007 and letter of appreciation under revised national tuberculosis control programme (RNTCP) on World TB day on March 24,2008 by the Health Department. He is employed with the Punjab State Electricity Board, Mansa. His zeal for social service hs made him known to people. To expect simplicity and honesty in modern politicians, in like looking fora needle in a haystack but Buta Singh ( ex-MLA) and CPI leader is an exception. He has been serving people with dedication and honesty for many years. He can be seen moving about cycling. People of Mansa term him gentle politician. He joined the Lal Communist Party in 1950. In 1952 he joined the Communist Party of India (CPI). He went to jail in the Khushesiati anti- tax morcha in 1958 - 59 and the land reforms morcha . He became MLA from Mansa in 1980. He campaigned for in this election on a bicycle against Trilochan Singh Riyasti, who had cavalcade of 124 cars for his campaign. Now he has been serving people as a kisan and CPI leader. People like him as he raises issues concerning people regardless of political affiliations. Kulwinder Singh Warraich, state vice-president of the Indian Federation of Trade Unions, has been raising voice against the increased electricity tariff in the state. Warraich, a unionist, has a considerable following among poor sections of society. Instead of organising a rally in protest, he has found a unique mode of protest. He, his wife Gurbaksh Kaur and son Sahil went on a march in the town. Holding placards the Warraich family tried to create awareness among the people about the increased rate of electricity. Warraich said though everybody felt the burden of the hike in power rates and rising prices of essential commodities but people just grumbled and did nothing towards a united protest. The motive behind the protest by just one family is to mobilise all the families in the town to raise voice against wrong policies of the government. The government, instead of increasing electricity rates, should have measures like stopping irregularities and corruption in the functioning of the PSEB, check power theft and improve the power supply. why the government was burdening the common man by increasing power tariff, lamented Warraich.